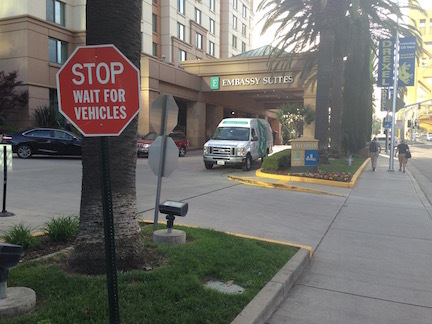 The sign at right is posted prominently at the eastern driveway of the Embassy Suites Sacramento, on Capitol Mall at Tower Bridge. The sign is illegal, as no sign on private property can direct people on public property what to do, particularly when the sign uses the standard red octagon which is reserved for official stop signs. But more importantly, it is offensive to anyone who walks. What is the hotel saying by posting this sign? That we welcome people who drive cars, who should not have to stop for pedestrians even on the sidewalk, and we reject people who walk, because they are second class citizens, not our customers? This sign has been here at least since December 2013, and I have talked to management at the hotel twice about it, and it is still there today. They really don’t care. TransForm’s Transportation Choices Summit took place today at the Embassy Suites. I’m not sure how many participants approached from a direction that they would have seen this sign, but I would guess that everyone who saw it was offended. This sign directly works against the efforts of every single person who attended the summit. I have to publicly ask that TransForm, and everyone else, boycott Embassy Suites until this sign is removed. Holy crap, that’s insulting. I emailed TransFormCA about this as well; I’ll let you know what their response is. They actually got Google to blur out the sign! I contacted corporate about this (and included CVC 21952); I received a response today asking for three business days to look into the matter. I’ll report back.